BEIJING, Dec. 15 (Xinhua) — Affected by “adverse atmospheric diffusion conditions,” heavily polluted weather is like to haunt the Beijing-Tianjin-Hebei area and its surrounding regions in the next 10 days, an official forecast said Saturday. Beijing, in particular, will see a drastic change in air quality, with moderate or serious pollution to come from Dec. 19 to 22. The arrival of northernly winds will help improve the city’s air quality starting from Dec. 23. Air pollution in the Beijing-Tianjin-Hebei region will gradually ease around Dec. 24 thanks to a cold air effect, said the Ministry of Ecology and Environment in an air quality report for the rest of December. In the Yangtze River Delta, air quality is expected to stay good or slightly polluted, while in Fenhe and Weihe river basin in Shanxi and Shaanxi provinces, the chances of lasting serious air pollution are slim. In the next 10 days, air quality in northeastern China will be about average. The central and western part of Liaoning however might suffer from moderate or serious air pollution on Saturday, with PM 2.5 being the primary pollutant. The pollution process will gradually ease from Sunday to Monday thanks to good atmospheric diffusion. Air pollution of various degrees is also likely to appear in southern, southwest and northwest China. Monsoon season in India has just begun, but farmers in Andhra Pradesh, a southeastern coastal state of India, won’t need to look to the skies to know when to sow their crops. A new mobile application launched earlier this month and developed by a local agriculture research institute, Microsoft India and the state government tells farmers in the state which week is perfect for sowing seeds, the health of their soil and other indicators. The app uses rainfall data collected from farms in 13 districts in Andhra Pradesh over 45 years to give farmers a sense of when to start planting, Suhas P. Wani, director of Asia research at the International Crops Research Institute for Semi-Arid Tropics or ICRISAT, a research organization in Hyderabad said.Farmers are asked to register a mobile number with the state government, choose a language–currently limited to the regional Telugu and English–and enter details of the village, district or sub-district. The advice received could vary from farmer to farmer and from village to village, Mr. Wani said. “The app has crop-specific information such as 10 years of groundnut sowing progress data” to guide farmers who grow specific crops, he added. He said that constant data on crop yield was being collected on a monthly basis by field officers and sent for evaluation to provide regular forecasts to farmers. A weather button shows the temperature and rainfall as well as fertilizer recommendations for the day and projection for the next seven days. Additionally, a farmer can get weather alerts for extreme conditions like hailstorms or unseasonal rains that impact crop yields. Andhra Pradesh logged the highest number of farmer suicides in the country last year. At least 58 farmers took their own lives in the state, according to an agriculture ministry report. But not every farmer can afford to invest in expensive smartphone technology. So far, most of the farmers have requested to be sent the information via SMS message. Mr. Wani said once registered, farmers can get the predicted sowing date through SMS. “The main idea behind the application is to help farmers reduce losses by telling when to sow seeds or spray the plants,” he said. The application will be rolled out in other Indian states next year, based on feedback from farmers in the state, he added. India has agreed to work toward joining the Paris Agreement on climate change this year, India and the United States said on Tuesday, giving a jolt of momentum to the international fight to curb global warming. At a time of heightened tensions in Asia over China’s assertive pursuit of territory, the two countries also pledged to expand military cooperation and outlined principles for cooperation on cyber issues. President Barack Obama welcomed Indian Prime Minister Narendra Modi to the White House for their seventh meeting since Modi took office in 2014, underscoring the warm relationship between the leaders and the world’s two largest democracies. Modi is to address the U.S. Congress on Wednesday. “We discussed how we can, as quickly as possible, bring the Paris Agreement into force,” Obama told reporters. Climate change is a legacy issue for the U.S. president who leaves office in January. India’s potential entrance into the agreement this year would help accelerate its enactment, perhaps years ahead of schedule. India is the world’s third-largest greenhouse gas emitter after China and the United States. The two countries also welcomed preparations that could lead to the building of six nuclear reactors in India by U.S.-based Westinghouse, in what would be the culmination of some 10 years of work to resolve civil-nuclear issues. The joint statement said India and the U.S. Export-Import Bank were working to complete a financing package for the project and that the Nuclear Power Corporation of India and Westinghouse had confirmed engineering and site design work would begin immediately.It said Westinghouse and the Nuclear Power Corporation of India would work toward finalizing the contract by June 2017 – a year later than Westinghouse’s chief executive, Daniel Roderick, said he hoped for in an interview with Reuters in late March. Modi told an event organized by the U.S. India Business Council that relations between India and the United States were “closer than ever.” He said the planned reactor purchases would mark new era in nuclear and scientific cooperation.Modi’s address to a joint session of Congress will be a significant personal step. Although this has become a tradition for Indian prime ministers, he was once banned from the United States over massacres of Muslims. More than 1,000 people, mostly Muslims, were killed in sectarian riots in Gujarat in 2002 when Modi had just become the state’s chief minister. Modi has denied any wrongdoing, and India’s Supreme Court in 2010 ruled there was no case.In the joint statement, the United States said it now recognized India as a “Major Defense Partner” and would work on technology sharing “to a level commensurate with that of its closest allies and partners. “The text of a logistics agreement, which will allow the countries’ militaries to use each other’s land, air and naval bases, would be signed soon, a U.S. official said. There’s no doubt there are significant tensions and challenges in the region, which argues for closer coordination between our militaries,” he said.While Modi is generally popular with U.S. lawmakers, they criticize what they see as lingering unfriendliness to U.S. firms and a stifling bureaucracy, in spite of Modi’s pro-business image. They also question New Delhi’s record on human rights.Modi got a boost on Tuesday when Amazon Inc AMZN.O Chief Executive Jeff Bezos said his company would invest an additional $3 billion in India, boosting its committed investment in the country to over $5 billion. The Chinese central government on Friday approved a plan that maps out major climate change goals to be met by 2020. The State Council, China’s cabinet, gave a green light to the plan, which was proposed by the National Development and Reform Commission (NDRC), the country’s economic planner. A statement released on the State Council’s website urged the NDRC to carry out the plan. China has pledged to reduce its carbon emission intensity, namely emissions per unit of GDP, by 40 percent to 45 percent by 2020 from the 2005 level. It will also aim to bring the proportion of non-fossil fuels to about 15 percent of its total primary energy consumption. Other targets include increasing forest coverage by 40 million hectares within the next five years. The government will speed up efforts to establish a carbon emission permit market, under the plan, which also calls for deepened international cooperation under the principles of “common but differentiated responsibilities,” equity and respective capability. The State Council said local governments and departments at all levels should recognize the significance and urgency in dealing with climate change and give higher priority to action on this issue. China’s release of the action plan came just before a climate summit to be held at UN Headquarters in New York on Tuesday. Chinese Vice Premier Zhang Gaoli will attend. Xie Zhenhua, deputy chief of the NDRC and the country’s top official on climate change, told a press conference that the plan was concrete action by China to participate in the global process to tackle climate change. By the end of last year, China had reduced carbon dioxide emissions per unit of GDP by 28.56 percent from 2005, which was equivalent to saving the world 2.5 billion tonnes of carbon dioxide emissions, Xie said. At the end of 2013, China’s consumption ratio of non-fossil energy to primary energy stood at 9.8 percent. Forest growing stock had increased by 1.3 trillion cubic meters from 2005 to two trillion cubic meters, seven years ahead of schedule, according to the official. In the first nine months of 2014, China’s energy consumption per unit of GDP dropped by 4.2 percent year on year and carbon intensity was cut by about 5 percent, both representing the largest drops in years, he said. As a developing country, China is the world’s largest greenhouse gas emitter. With the plan, the country has showed its confidence in achieving its green goals. via China approves plan to combat climate change – China – Chinadaily.com.cn. SO YOU want to live in a country that is guided by a philosophy of “ecological civilisation”, run by people with the vision to implement policies that will benefit their children even if it costs more in the short term? Move to China. Not convinced? Last week, news circulated that China is considering limiting its greenhouse gas emissions so that they peak in 2030, followed by an orchestrated fall. It was one man’s view, expressed at a Beijing conference, not an official announcement. But He Jiankun is chairman of China’s Advisory Committee on Climate Change, and his words are in line with actions China is now taking to address global warming. “Things are changing very, very fast,” says Changhua Wu of The Climate Group think tank in Beijing. To be clear, China is still the biggest emitter of carbon dioxide. Cities like Beijing are plagued by smog, and efforts to clean them up may just move the pollution elsewhere. But there is a huge push for change. Water scarcity and awareness that China will suffer from global warming are factors, but it is health concerns that loom large. The air in many cities is dangerous to breathe, the water is toxic and there are often food health scares. “People are fed up,” says Wu. Premier Li Keqiang has declared a “war on pollution”. His leadership has drawn up a philosophical framework called ecological civilisation. It aims to “bring everything back to the relationship between man and nature”, says Wu, and is driving major changes. Prompted by the idea that used resources must be paid for, China has launched carbon trading schemes in six areas. There, companies must pay to pollute, and abide by a cap on overall emissions. A seventh scheme should start within weeks. They will form the world’s second largest carbon trading scheme, after Europe’s. A national programme should begin this decade. China has set targets to make more wealth using less energy and it is on course to meet them. It contributes one-fifth of global investment in renewables, more than any other nation, has more installed wind power than anywhere else and in 2013 doubled its solar capacity. The smog is turning people off dirty power. Construction of coal-fired power stations peaked in 2007 (see graph), and smaller power stations are being switched off. According to the London-based think tank Carbon Tracker, 10 out of 30 provinces have cut their coal use, and wind capacity is growing twice as fast as coal. “The coal-fired power plants that China is building are some of the most high-tech and efficient available,” says Carbon Tracker’s Luke Sussams. There are also schemes in place to make people who pollute water pay those who suffer as a result. Environmentalists have pushed policies like these for years. But while Western nations debate them, China is testing them and rolling out those that work. via China battles to be first ecological civilisation – environment – 13 June 2014 – New Scientist. China will invest 16 billion yuan (2.6 billion U.S. dollars) to protect Sanjiangyuan, the cradle of the Yangtze, Yellow and Lancang rivers in northwestern Qinghai Province. The second phase for the ecological protection and restoration of Sanjiangyuan was officially launched on Friday. 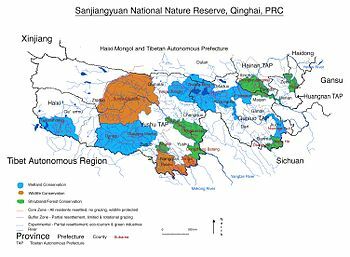 According to the protection plan, the restoration area will be expanded to 395,000 sq km, or 54.6 percent of the total area of Qinghai. Although the first stage has brought remarkable improvements, the overall ecological degradation of the area has not been fundamentally curbed, said Du Ying, vice director of the National Development and Reform Commission. The second phase will involve protecting the environment, improving people\’s livelihoods and achieving coordinated economic, social and cultural development, said Li Xiaonan, a Qinghai official for the Sanjiangyuan project. With an average altitude of 4,000 meters, the Sanjiangyuan region has long been a paradise for herders, rare wild animals such as the Tibetan antelope and medicinal herbs like the Tibetan snow lotus. via China invests 2.6 bln USD to protect major riverheads – Xinhua | English.news.cn. As China\’s smog levels crept past record highs in early December, the phone lines at pollution-busting kit maker Broad Group lit up with Chinese customers worried about hazardous pollution levels that have gripped China this year. China\’s government is struggling to meet pollution reduction targets and has pledged to spend over 3 trillion yuan ($494 billion) to tackle the problem, creating a growing market for companies that can help boost energy efficiency and lower emissions. \”Recently, we haven\’t been able to make products fast enough to keep up with demand,\” said Hu Jie, a general manager at Broad Group, which makes pollution-related products ranging from hand-held monitors to eco-friendly buildings. Sales roughly doubled this year from 2012, Hu said, without giving details. Pollution problems in China, the world\’s second-biggest economy, are by no means new. But heightened public anger – and a growing political will to deal with the issue – has created opportunities for firms with sustainable know-how to earn a slice of China\’s clean-technology market, which is set to triple to $555 billion by 2020, according to the U.S. Department of Commerce. \”China has reached a saturation level which people can no longer tolerate,\” said Feng An, president and executive director of the U.S.-China Clean Tech Center, which takes U.S. clean technology companies to China to meet potential partners. Pollution cost China\’s economy at least 1.1 trillion yuan ($181 billion) in 2010, the environment ministry estimated this year – equal to 2.5 percent of GDP that year. Pollution has been tied to \”cancer villages\” and reduced life-expectancy. Smog even closed down the major northern city of Harbin in October. Acknowledging public anxiety over the issue, Premier Li Keqiang said in March that China should not sacrifice the environment to pursue economic growth, giving a boost to \”green\” companies. U.S. environmental engineering company LP Amina, which helps coal power plants reduce emissions by retrofitting burners to make them more efficient, saw its China sales double this year, said the firm\’s marketing manager Jamyan Dudka, without providing specific figures. Coal accounts for more than two-thirds of China\’s primary energy consumption. China is pushing to reduce nitrogen oxide (NOx) pollutants from power plant emissions and offering subsidies to get firms on board. The cost of retrofitting all China\’s power plants over a 5-year period is around $11 billion, said Dudka. Atkins is working with local governments to develop sustainable construction guidelines and will partner with two Chinese cities to put them into action. China\’s contribution to the company\’s 88 million pounds ($144.6 million) in Asia-Pacific revenues increased to 40 percent this year, it said. The region accounts for around 5 percent of global sales. via Opportunity glimmers through China’s toxic smog | Reuters. China\’s capital Beijing, regularly shrouded in hazardous air pollution, plans to replace its oil-burning buses with greener models by 2017 to help clear the smog, state news agency Xinhua said. Nearly 14,000 new buses powered by electricity or natural gas will be bought to replace two-thirds of Beijing\’s bus fleet and halve carbon emissions, Xinhua said on Thursday, citing the city\’s environment and transportation authorities. Air pollution in Beijing hit unprecedented levels in January when an index measuring particulate matter with a diameter of 2.5 micrometers (PM2.5) shot up to a staggering 755 – 38 times the level recommended by the World Health Organisation. China\’s worsening air quality is a result of it chasing economic growth at all cost in the past 30 years, a pursuit that turned it into the world\’s second-biggest economy, but which also poisoned much of its air, water and soil. Rising public concern over the health dangers of China\’s air pollution has worried its stability-obsessed leaders, who fear the issue may become a rallying point for wider dissatisfaction. China has adopted an emergency response program to try to reduce the pollution, including alternating days for cars with odd and even license plates to be on the road and closing schools when the smog is particularly heavy. via Beijing to buy new buses to clear city smog: media | Reuters.